Aortic valve (AV) sparing and repair procedures are advantageous alternatives to valve replacement in patients with aortic aneurysm and/or aortic regurgitation. A successful sparing or repair strategy proceeds first from a clear understanding of the peculiar anatomy and function of the AV and of the possible mechanisms of valve dysfunction. The AV is a functional unit composed of the valve cusps and the functional aortic annulus (FAA). Lesion on any or more of these components can induce aortic insufficiency. A functional classification of aortic regurgitation identifies three main mechanisms of AV regurgitation although more than one type of lesion can coexist in a patient. The goal of AV repair is to restore a normal surface of coaptation by restoring normal geometry between the leaflets and the FAA, while preserving normal mobility of the AV cusps. 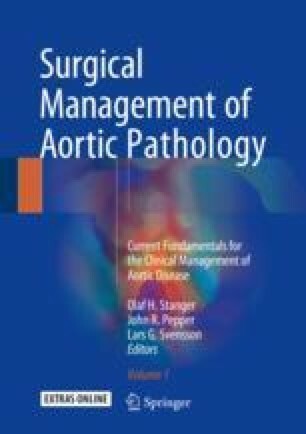 We present in detail our preferred surgical techniques for valve-sparing root replacement (VSRR) and repair of the AV cusps in the context of tricuspid AV. Further, we discuss the peculiarities of the VSRR and repair techniques in the context of bicuspid AV including our preferred approach to the bicuspid aortic dilatation.